As I get closer to the end of building a dulcimer the tools I use get smaller. Work begins by resawing at the bandsaw, then comes handsaws and bench planes, then comes smaller planes, chisels, knives, and scrapers. 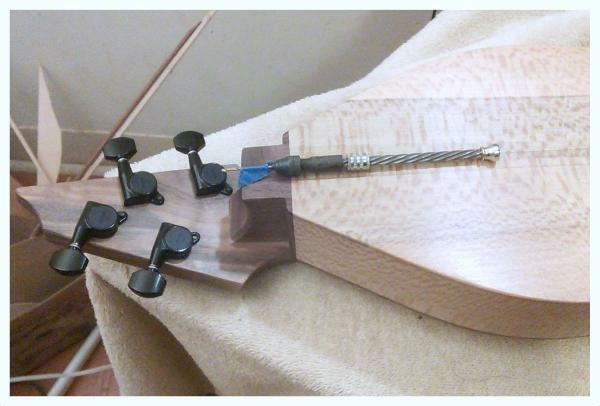 The last parts to go on a dulcimer are the tuning machines. The screws that hold the tuning machines in place are very small and require small pilot holes. For years I drilled these with an “eggbeater” hand drill. This worked but the drill always seemed a little big for the job and sometimes getting the chuck to clear the tuners and the end of the dulcimer required some hand drill yoga. Not too long ago while looking for a tool that was hiding somewhere in the shop (an all-too common event) I found a small Archimedean jewelers drill I bought years ago because it looked interesting. It was inexpensive and I liked it so I bought it even though I couldn’t think of a use for it at the time. This little drill was just the right size for drilling pilot holes for the tuner screws. The blue tape serves as a depth stop because accidentally drilling through to the face of the peghead is not a good idea and something best avoided. The drill works on the principle of Archimede’s screw. Sliding the collar on the spiral shaft causes the chuck to turn round and round. Another problem solved by ancient science and another tool to play with! All in all a fun moment in the exciting life of a dulcimer builder! It’s a small version of the Yankee Hand Drill. Do you know a source for them? You know, I hadn’t thought of that but you are right! And i love my Yankee drill! I did a quick search for “Archimedes jewelers drill” and a lot of sources popped up. Dislodging a green nut from it’s shell is almost impossible, but let it dry and the lightest tap will do it.